Organize all your digital files including photos, videos and other data files with the WD My Cloud PR4100 Media Server. It has the Quad Core Intel Pentium N3710 1.6 GHz Processor that gives you a seamless & high-speed processing power and the 8TB HDD gives you massive storage capacity. Also the 4GB DDR3L RAM enables you to perform memory-intensive tasks with an increased bandwidth. My Cloud PR4100 comes with built-in hardware transcoding, so your video is prepared for streaming through the Plex media server whenever you need it. It is also equipped with My Cloud OS 3, that makes the setup simple. This server supports RAID 0, 1, 5, 10, as well as JBOD and spanning configurations, for added performance or data mirroring options. Its Password protection and AES 256 bit volume encryption feature provides complete data protection & security. It even lets you share specific files or folders or create a shared folder with user permissions for access and save across multiple computers. 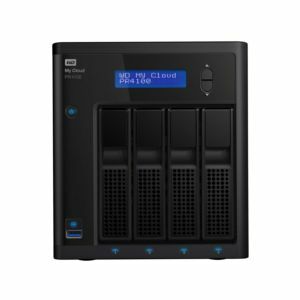 Order the WD My Cloud PR4100 Media Server for all your data storage solutions!